I am not crazy over small insurance companies. This is especially so when over the recent few years, there were quite a spate of major acquisitions by very large insurers where deals such as MSIG took over HLA, AIG taking over ING, Allianz on MBA and several other consolidations in the industry like the ones involving AmG, Kurnia, CIMB, Aviva, Sun. P&O is a decently managed standalone insurer where it is not bank-backed, does not have direct relation or any particular bankassurance agreement with any of the larger banks or even the larger insurance companies. It was a Jerneh or a Kurnia like before them being acquired. 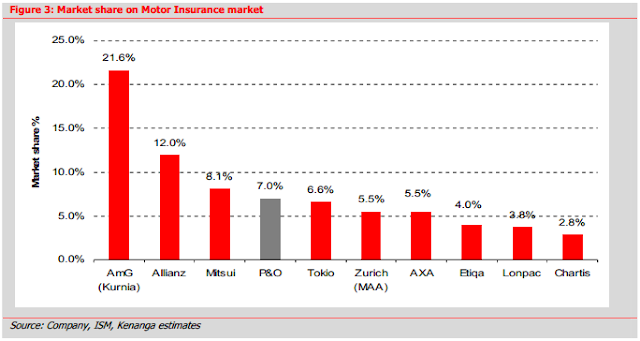 Insurers like this will face increasing competition as tie-ups are very important in the insurance arena. Shareholders funds and strength of the books are very important as well. There are risks which large insurers dare to take while the smaller ones do not have the size or even the experience to take up larger risks. As such, I was not particularly interested in companies like this having invested into Jerneh before despite it being a well run company. To me, the only attraction with P&O is it being an acquisition target. Market is valuing at least a 2.2x of book value for a Malaysian insurance company. And very recently, the holding company for P&O did not actually sell out but rather signed a deal for it to sell 49% of its insurance arm to a group under Sanlam. 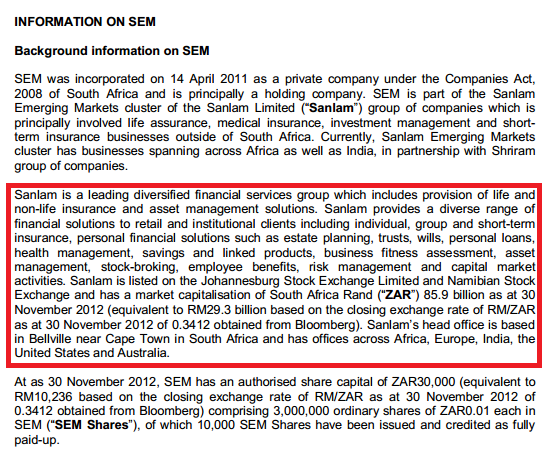 Who is Sanlam? Not particularly big but still it is a much bigger partner for the standalone P&O. Now, is this a good deal for P&O? 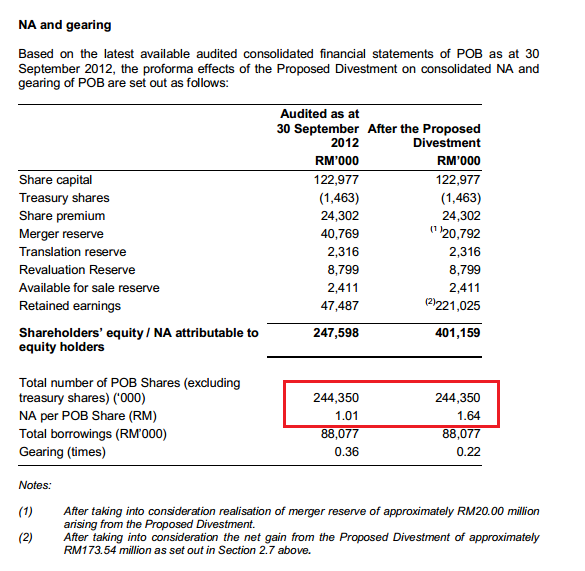 It is as I see it, the owner of P&O is selling a 49% stake, (hence still holding a 51% ownership) and for that stake, the price is RM270 million cash valuing it at 2.46x NAV. Not too shabby a deal. The deal still does not attract me, but what attracts me is the much improvement of the holding company's (listed) balance sheet and book value. Since it is all cash deal, it would have put the company into a net cash company from its current debt of RM88 million to about RM182 million net cash. At its current market capitalisation of RM314 million, P&O suddenly looks attractive for the immediate term. After the disposal, P&O unlike the other insurers like MAA and Kurnia, does not need to seek other businesses (hence no PN16 or PN17). It still continues to hold a majority 51% stake which is great. On top of that, its current traded price is still below the book value of RM1.60 upon completion of the exercise and the bulk of its holdings in cash. Whether the company is to distribute the a portion of the cash is currently unknown but what I see was that the company did distribute its excess cash as dividends when it had them. It is not a company which holds on to the cash within the listed company. I certainly hope for the company to distribute the cash if I am a shareholder. The MAA route is not a preferred route definitely and looking at P&O, my gut feeling is that it won't go the MAA route which is holding onto the cash. P&O has been very careful venturing into businesses like money lending despite it having the license to do so. Hence, why hold the cash when you do not need it? If you read above, the period when there was no dividend in 2009 and 2010 was when the insurer was required to shore up its shareholders funds due to requirement by Bank Negara. When its balance sheet strengthened, it was back to issuing dividends as in 2012. Besides the book value, is P&O an attractive growth company. It is not. However, since its focus has been into insurance for the motor industry, I believe its profit margin would have increased as the revision in motor insurance rates started to kick in since a year ago, 1 January 2012. Looking forward with the larger insurers being very aggressive and starting to understand the local insurance market better, I do not see P&O will be a strong growth insurer. It does however has a sweet position in the motorcycle insurance market though as I understand and that portion is hugely profitable. And anyway, the book value still looks attractive enough. Whenit comes to M&A market always value it base on the NTA. Shall we wait for the M&A to materialise ? That is very subjective. I myself prefer growth. If there is no growth for the company, it is purely a betting case for P&O. After all one need to consider the opportunity cost that for me is a major cost to be seriously considered. If one to use NTA to value P&O as suggested as 2.2x ( at least ) as suggested, then Allianz shall be a better bet. On top of it's growth story, it is recently traded at 7.++. As on 30/09/12 it's NTA stand at RM11.39. If we take it's Allianz-PA into consideration it's NTA shall be at around 11.39/2= 5.69 per share. Shall we value it at 2.0x NTA ... it shall be valued at RM11.39. So now, why the market value it at 7.++ ( 0.6++ x NTA but value P&O at 2.2+ NTA ? it is just my 2 cent P&O is not really attractive to me. At the very least once shall consider the opportunity cost. After all investing is not a " betting " excercise per se. I do not see this as a bet as you can see in all my articles.. I am attracted to Allianz as well but I felt that Allianz may have started to already fully utilised its bancassurance deal with CIMB which was signed in 2007. That was the reason it went on a phenomenal growth. After having acquired many of CIMB's general insurance customers, its growth will be more normal. Having said that, I am still monitoring Allianz which obviously is much bigger. KUALA LUMPUR: RAM Ratings Services has reaffirmed YTL Power International Bhd (YTLPI) commercial papers with a long term stable outlook. RAM Rating Services had on Monday, reaffirmed the AA1 long-term rating of medium-term notes programme of up to RM5 billion (2011/2036), as well as the AA1/P1 ratings of its RM2 billion commercial papers or medium-term notes programme (2007/2014). It said in a statement that the ratings reflect YTLPI's robust business profile that is underpinned by its base of regulated assets, particularly its investments in power and water-sewerage services via wholly owned YTL Power Generation Sdn Bhd (“YTLPG”) in Malaysia and YTL PowerSeraya Pte Limited (“YTL PowerSeraya”) in Singapore. However, it said the group capital structure remained constrained by its hefty debt burden of RM22.99 billion as at end-June 2012, with a corresponding adjusted gearing ratio of 2.38 times. “Taking into account its RM9.63 billion of cash reserves, of which RM8.09 billion is free from encumbrances and will be readily available for the company if required, its adjusted net gearing ratio works out to 1.40 times,” it said. I've bought CYpark, the mini IPP for green energy, namely solar, biogas and biomass. CYpark is awaiting 20MW Biomass in its landfill at ladang Tanah Merah to be official sign under BOT for 25year concession. CYpark currently already operate in Tanah Merah landfill site to treat and dispose municipal solid waste. As the landfill is capable to generate biomass up to 20MW, CYPark is secure concession and sign feed in traffic concession with TNB, it will enable CYpark not only derive eanring from tipping charge on solid waste but also earning from generating power from biomass. CYpark also replicate these integrate renewal energy park in other 3 other landfill, namely Bukit Palang (NS), Rimba Terjun (Johor), Kuala Perlis (Perlis), totaling another 20MW solar + 5 MW biogas. I bought a few at 1.28, the company itself also repurchased a lot recently. However I realized it might be a little bit unwise because I don't have the sufficient cash reserve to prepare for the upcoming election. What's your opinion on the re-insurance MNRB ? It's trading 1/2 of it's NTA. Rhb is the only IB covering this company with a target price of 0.6 times NTA (Rm3.09). Also PNB was reported to be interested to sell some time back but there has been no news on that..
A look at Redtone - what is a 4G spectrum worth? MKH: How can this happen? Is Hai-O picking itself back? YTL Power - value share or value trap?